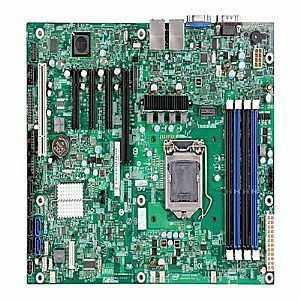 Marketing Information: Entry Intel® Server Board with essential server-class featuresThe S1200BT supports the Intel® Xeon® processor E3 1200 series and will support the next generation processor once available, ensuring future upgradeability. Shipping in two variations: S1200BTSR base SKU and S1200BTLR with optional Intel® I/O or Management Module.Target applicationsSmall- and medium-sized business applications including web servers, file and print servers, e-mail servers, storage servers, and vertical-specific business applications. Also suitable for High Performance Computing (HPC) and embedded applications.The Intel® Server Board S1200BT provides server-class performance without sacrificing cost-effectiveness or reliability to support the success of a workgroup, department, or small- to medium-sized business.